Is Your Wedding Photographer Outsourcing Their Workload? Taking the picture is only part of the process to creating a beautiful photograph. Developing and working on RAW (Digital Negative) files not only can enhance a well taken photograph, it can take it to another level all together. I feel that a substantial part of my style comes from what happens AFTER I take the picture. Q. Why do you use long lenses and what are advantages when photographing weddings or bridal portraits? A. I use them for several reasons. One reason is they allow for a more comfortable shooting distances. With longer focal length lenses (100mm – 300mm) I don’t need to be in the bride and groom’s face. In fact, they may not even be aware that I am taking their picture. This holds true for guests during the ceremony and reception. 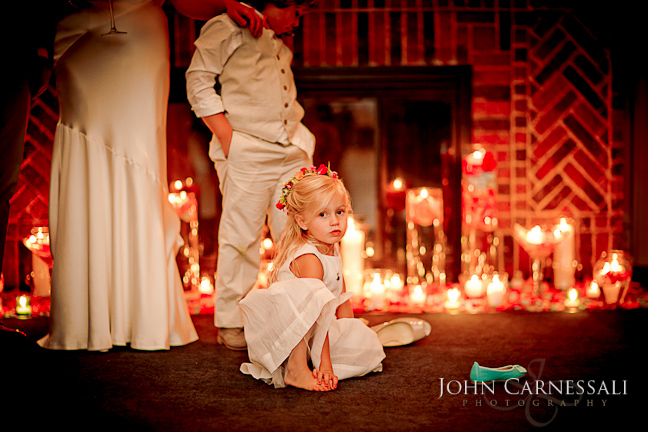 Having longer focal length lenses allows for more candid and photo journalistic wedding photos. compression allows for a more flattering photos. It can be somewhat complicated to explain so I have provided some pictures taken by the Stephen Eastwood which show how different focal lengths can distort a persons face. 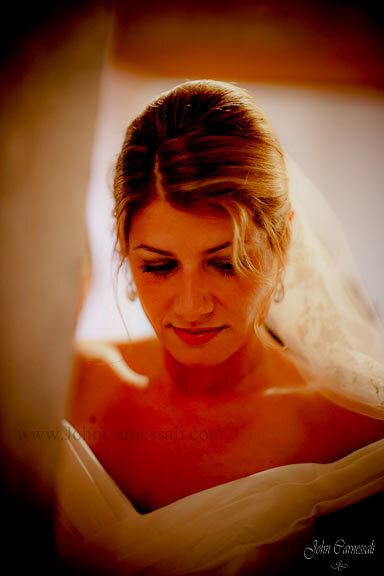 With longer focal lengths it compresses the facial features, which in general, produce more flattering wedding photos..
Q. Do you have any suggestions for brides and grooms? A. 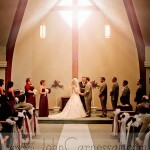 If you are considering a wedding photographer, inquire about the kinds of equipment they have. In my opinion it is vital that the photographer have various lenses at their disposal. Wide angle lenses are wonderful for capturing the whole scene, but longer focal lengths are essential IMO for beautiful wedding portraits. So make sure they have at least one lens that is 100mm or longer (ie 135mm, 200mm, etc). Q. What kinds of lenses do you use for wedding photography? Which lenses are best for wedding photography in your opinion? A. I use the Canon 70-200mm 2.8 IS as well as the Canon 135mm f/2 for wedding portraits. I also like to use the 85mm 1.2 because of its razor thin DOF (depth of field). When I want to capture the entire scene whether it be the ceremony or reception I use the Tamron 17-35mm, Canon 24-70mm 2.8 or the Canon 35mm 1.4. Here are some examples as well as link from Steven showing the difference in focal lengths, distortion and perspective. As you can see their are subtle differences between the focal lengths 100mm and 350mm. The changes start to become apparent at 70mm and very apparent by 50mm. 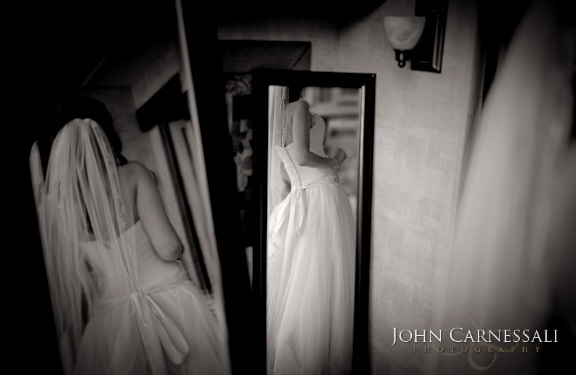 Sometimes brides and grooms will wonder if they should get photographs of the couple getting ready before the ceremony. If their budget allows, I often suggest they do. These actually tend to be some of my favorite photographs. The energy is high and emotions are flowing. During this time I try to stay inconspicuous and out of the way. I want people to feel free to be themselves and not constantly aware that they are being photographed. I am very excited to have stumbled across this blog and was also excited to submit some of my own work for possible inclusion in their blog or perhaps even to have one of my photographs chose as one of the best wedding photographs of the year! Excited, I read the terms and conditions and came across this. 🙁 Unfortunately I won’t be participating … Handing over the copyrights to photographs I have taken at a wedding is something I am not comfortable with, nor do I think my clients would be pleased. Boo hoo.. Anyway, I still wanted to share this fantastic site.. perhaps some of my grooms and brides will be inspired! I couldn’t keep it to just 5 (LOL).. I have recently come across some great wedding photographers and wanted to share. I like each for their own reasons. What I like about all of them is their distinct “voice” and imagery. Please comment below and share some of your favorite wedding photographers. 1. Chrisman Studios – San Francisco Wedding Photographer.